We’re also simultaneously developing the Sony ports, if you’re wondering, and though there’s still a huge amount of work to do to get the game fully running on these consoles, this is most definitely a great start. 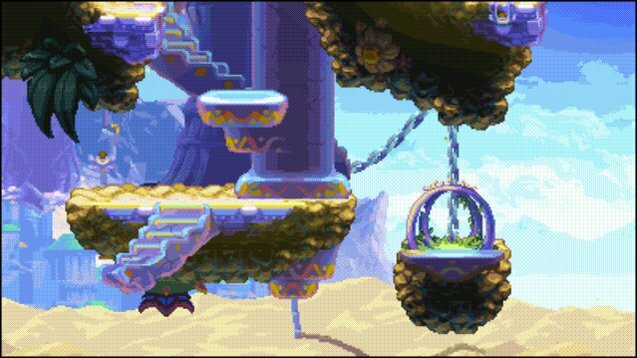 A wild, extra eighty pixels appear! 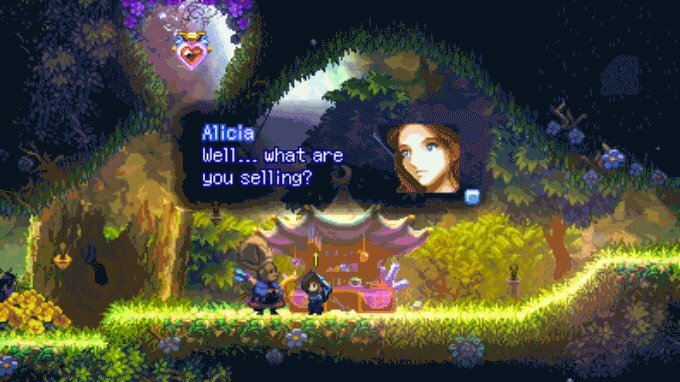 If you yet haven’t realized from the screenshot above, Heart Forth, Alicia has evolved into… Widescreen Heart Forth, Alicia! It took some thinking and planning to do, but the game’s aspect ratio has been successfully changed from 4:3 to 5:3 (or 15:9, which is very close to the standard 16:9). 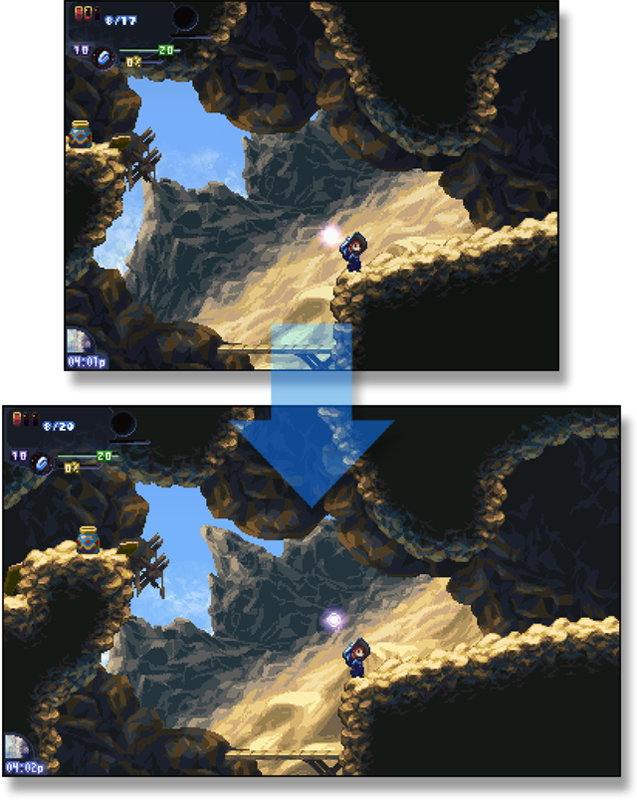 This means the game’s resolution grew from 320×240 to 400×240, which is also the pixel resolution of the Nintendo 3DS (not counting the doubled vertical lines). There’s a lot of room adjusting to do yet because of this new 400×240 paradigm, but the important switch is already done, and the rest is just lesser grind-work. I had originally chosen the 320×240 (4:3) ratio because it was the standard resolution for most of the original Playstation games, and even though the look is appealing to people like me who grew up with that generation of games, HFA would’ve probably been harmed by this decision once it was released to a more general public. During this past couple of weeks I’ve also added a few more interesting modifications to the game. Some of them include redesigning the Earth Spell to be more controllable by the player. The Earth spell used to have a random factor with which 2-3 enemies were targeted for damage, and any other enemies were left untouched. Now, the spell works more like Castlevania’s axe ability, and boulders are thrown in the direction you’re facing. Any enemies found in the path of the boulders are automatically damaged, giving you a wider scope and control over which enemies or obstacles can be targeted. Another cool change was to add multiple item-drops from enemies. Before, if an enemy was able to drop 3 different items, only one item was selected via a dice-roll, and then that item’s drop-rate was calculated. Now, all possible items can be dropped at once if the drop rates of each one is met, and they’re dropped in a nice bag that you can pick up & open after an enemy is killed. Pues se ve mucho mejor , esto de las resoluciones siempre es un dolor de cabeza , espero que todo salga bien ! I’ve set this page as my homepage looking to see if i could follow this game as it grew in development, so it’s nice to see an update. Hope you guys do more of these sooner or later! Glad more Metroidvania games are coming to 3DS. Glad to see this game is moving along. There has been a dearth of 2d platformers, of late. Is there a progress bar on this site, similar to the one on kickstarter, that shows how close the 3ds version is to being funded? I thought with nintendo’s approval, 3ds was already a go? Super excited, regardless. Looks like a great game, with a rich story, and positively enthralling gameplay mechanics. @Brentums We’re about $8k away from funding the 3DS stretch goal. I personally think we’ll get there, but I guess we have to wait and see :) We’re nevertheless already taking measures to ensure the game can run fine on a 3DS. Will it be possible to switch back to 4:3 in game options ? Please give us the choice i beg of you. I use to play this kind of games on a real crt tv in 240p mode. The render is just magic this way. It won’t be possible with a widescreen only format please give us the choice to enjoy this game on multiple formats.